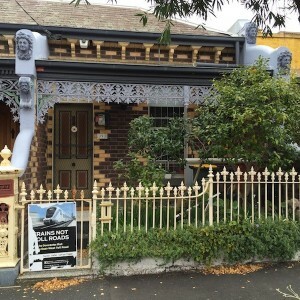 The property at 6 Erin Street is one of a pair of Victorian two storey terraces. The terraces were built in 1870 and feature tall decorative render parapets with a central pediment with a balustrade either side. 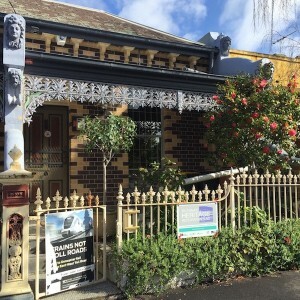 The terraces are substantially intact and also feature a cast iron decorative balustrade to the upper verandah, a cast iron palisade fence to the street and fine render detailing around the windows and doors. 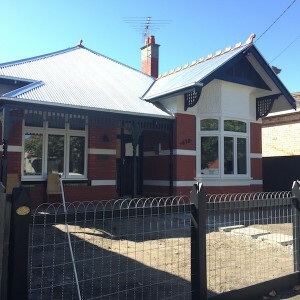 The terrace is a contributory building in the West Richmond Heritage Overlay. The grant application was for repair and reinstatement of the render balustrade to the parapet. The existing steel lintel on one side of the balustrade was corroding and pushing render off the parapet. In November 2016, the VHRF Committee of Management agreed to offer a grant of $10,000 towards repair and reinstatement of the deteriorated parapet. The works involved like for like repairs to return the parapet to its original appearance and further collapse and resulting water ingress has been halted. 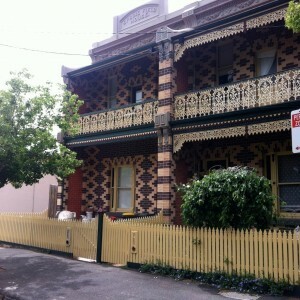 This is one of four single storey terraces constructed between 1905 and 1908. 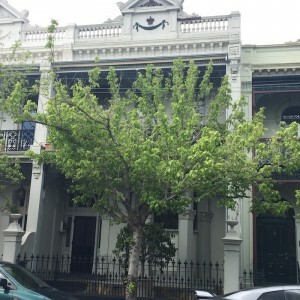 The single fronted Federation terrace has render banding to the façade and a decorative render parapet. The building also features a pair of tall narrow windows and a verandah across the front with a cast iron frieze. There were remnants of the original black tuckpointing however this was in a visibly deteriorated state with some sections of tuckpointing missing. The VHRF Committee of Management agreed to offer a grant of $5,000 towards the cost of re-pointing the front façade, side walls and brick fence pillars. The tuckpointing has greatly improved the appearance of the building in the streetscape. This is one of a pair of single storey Victorian brick terraces with a slate roof. It has bi-chromatic brickwork including to the wing walls. 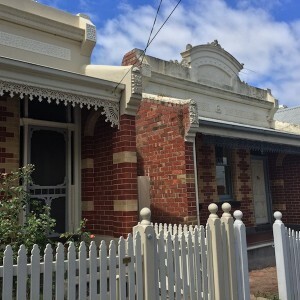 The terraces are particularly decorative with a curved wing walls, render moldings and brackets, original cast iron fence and verandah frieze and decorative brickwork to the eaves. In May 2016, the VHRF Committee of Management agreed to offer a grant of $4,500 towards tuckpointing the front façade, above verandah and wing walls. The works were completed in June and July 2016 and were undertaken by Mortar and Surface Restoration. The works have lifted the appearance of this building as viewed from the street. The front façade has now been fully restored to its original appearance and condition. This is an elegant double fronted brick Edwardian house. The building is substantially intact and demonstrates interesting Edwardian features such as the gable roofed projecting wing with bay window and gable with half timbering and brackets. 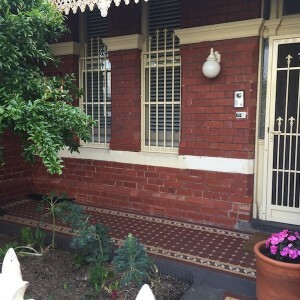 The front verandah has turned timber posts and an unusual deep timber frieze. 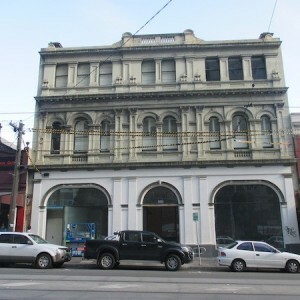 The building is contributory in the North Fitzroy Precinct HO327. The tall brick fence substantially detracted from the appearance of the property in the streetscape. In February 2016, the VHRF Committee of Management agreed to offer a grant of $12,000 towards the cost of fence replacement, roof replacement in corrugated galvanised iron and mortar and tuckpointing. 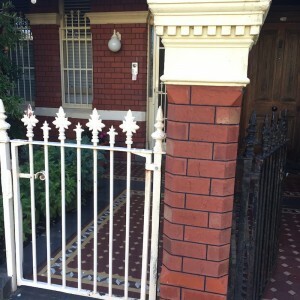 The works have transformed the street appearance of this property and returned it to its former glory. The replacement of the fence with a permeable fence more sympathetic to the style of the dwelling demonstrates the positive impact an appropriate fence can make on the streetscape views in a Heritage Overlay Precinct. Payment of the grant can now be made in accordance with the agreement between the applicant and VHRF. 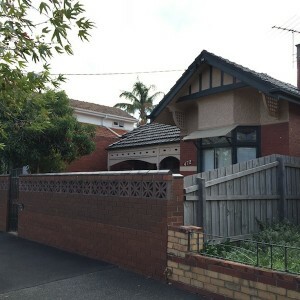 This residence is a detached single storey terrace. It is Italianate in style with a decorative parapet with a pediment. The front façade was rendered at some later date, but its adjacent pair indicated that it originally had bichrome face brickwork to the front. The VHRF Committee of Management agreed to offer a grant of $4,000 towards tuckpointing. The render removal and tuckpointing has transformed the streetscape appearance of the building and it now matches its original pair once again. 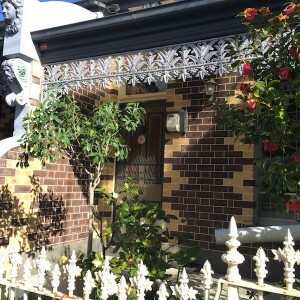 This is one of a pair of two storey decorative Hawthorn brick terraces with cream brick patterning across the entire façade. The terraces have a render cornice and parapet with a rectangular pediment and festoons to the cornice. 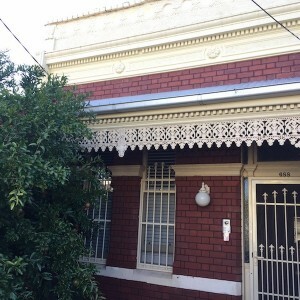 The verandahs have case iron friezes (missing to No. 60) and a cast iron lacework balustrade. The VHRF Committee of Management offered $6,500 towards verandah frieze reinstatement and tessellated tile reinstatement to the verandah floor and path. The works involve the reinstatement of the case iron frieze to the verandah at both levels and reinstatement of tessellated tiling to the verandag floor and entry path. 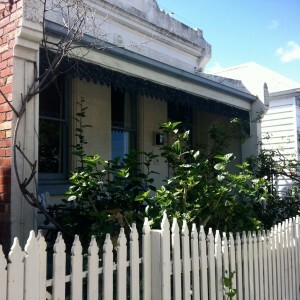 The cast iron frieze will match the adjacent terrace at 58 Fergie Street, which is a pair with this terrace. The owner has provided evidence that the tessellated tiling to the verandah floor and path was an original feature of the terrace. The pattern of tiling for replacement has been designed to match the original tile pattern as closely as possible. 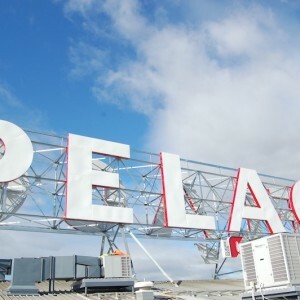 The PELACO Sign was erected in 1939 on top of the PELACO Company’s factory in Goodwood St, Richmond. 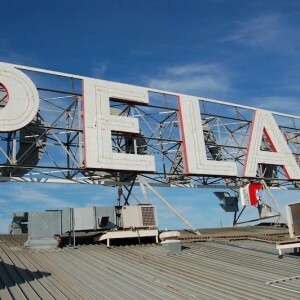 The sign, a large double sided sky sign with individual box letters illuminated in neon, is historically significant for its associations with PELACO, the best known shirt manufacturer in Australia. The PELACO sign is socially important with its size and prominence symbolising the dominant role played by the PELACO Company in Australia as a shirt manufacturer. 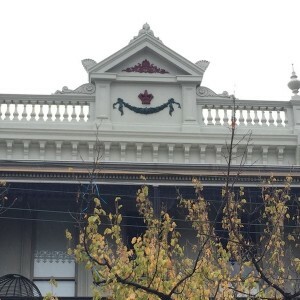 The sign also symbolises the social and economic importance of Richmond as an industrial suburb and its importance in the heartland of Victoria’s clothing and textile industry. The VHRF Committee agreed to offer a grant of $50,000 towards fabrication, supply and reinstatement of new letters. 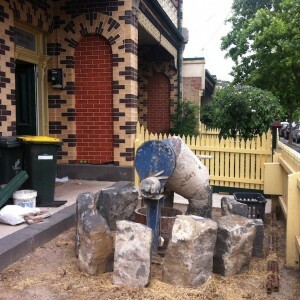 The works have reinstated an iconic feature of the Richmond skyline in accordance with the Heritage Victoria permit. This historic building was constructed in c. 1899 and originally operated as Pearce’s Great Drapery Warehouse. 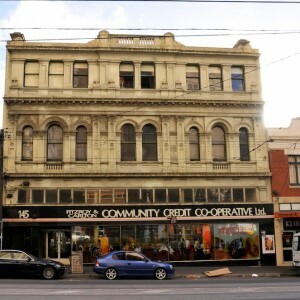 In March 2014, the VHRF Committee of Management agreed to offer a grant of $32,000 towards reconstruction of the shop front configuration based on a historical image of the building found at the State Library of Victoria. The ground floor façade reconstruction has transformed the appearance of the building and considerably enhances the historic streetscape.